This new Second Edition includes 210 Kansas State URLs, of which 25 are catalog and reference links. The rest of the URLs link to databases. Three Hundred Thirty-Five National URLs are also included. There are an additional 10 pages in the Second Edition (as compared to the First Edition). All Dollarhide state Name List books currently come with a FREE download of the full-color pdf eBook. Upon placing your order, you will be able to download the FREE PDF eBook directly from the FRPC screen. You will also be sent an email from where you can click on the link and download the item. You can only download the PDF eBook once, so if you make your order from a computer other than your own, you might want to wait until you get to your computer and do the actual download from the email. Your book itself will be mailed by USPS media mail, and can be expected to arrive within 7 to 10 days within the United States. With this series of genealogical guides, William Dollarhide continues his long tradition of writing books that family historians find useful in their day-to-day United States research. Bill’s Name List guides give a state-by-state listing of what name lists are available, where to find them, and how they can be used to further one’s research. Name lists are key to success in any genealogical endeavor. Name lists, be they national, state, county, or even city or town in scope, can help nail down the precise place where one’s ancestor may have lived. And if that can be done, further records, usually found on a local level, will now be accessible to research. But success depends on knowing where the ancestor resided. This is where Dollarhide’s Name List guides can make the difference. 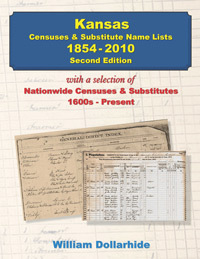 Not only does this volume give a detailed bibliography of Name Lists available for the state, but links to websites, FHL book & microfilm numbers, archive references, maps, and key historical information make this volume invaluable to the researcher looking to extend their lines and fill in the family tree. This book is also available in a PDF eBook format only. Map: Counties in 1860 Kansas Territory.